Sri Lanka, rich in spirituality and famous for its Ceylon tea, is a small island country in the Indian Ocean, south of India. Gorgeous Buddha statues, illuminated at night, stand nobly at the corners of many streets in capital city of Colombo. On the warm and sunny afternoon of April 29, people began entering the spacious Grand Ballroom of the Trans Asian Hotel. This beautiful facility in Colombo has a five-star rating and is located in a harbor on the country's west coast, facing the Indian Ocean. It didn't take long for the lecture hall to fill with people. One Dutch man who attended the lecture said that he had flown all the way from the Netherlands to meet Master. He added that he had searched for many years, even going to India to seek the Truth, and was waiting now for an inner "signal" to tell him that the Quan Yin Method was the right path for him. Another person, a man from England, came to see Master because he was still not at peace with himself, even after becoming a monk in a monastery. 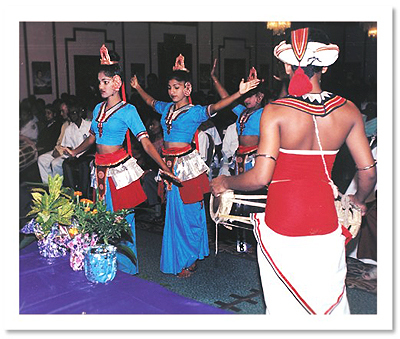 A local Kandian drum dance team welcomes Master to Sri Lanka. To introduce Master's work, the new videotape entitled "Looking at the Past... Stepping into a Bright Future" was shown, which described Master's European Lecture Tour from May to June 1999. Then, a local Kandian drum dance team led Master to the front of the hall, passing a respectfully standing crowd. (Kandy is a Sri Lankan city located in the middle of the country.) Wearing a light violet blouse and long, dark purple skirt, Master looked youthful as Her long, brown hair flowed down to Her shoulders. To pay Her respects, Master humbly bowed to the Sri Lankan monks sitting in the front row of the audience. Then, following a local tradition, Master lit a string in an oil lamp with a candle and passed the candle to other local people so they could light the remainder of the strings. To the delight of Master and the audience, the colorful dancers and drummers then performed a Kandian dance accompanied by chanting and drumming on tablas (traditional drums used in India and Sri Lanka). To pay Her respects, Master humbly bows to the Sri Lankan monks ottending Her lecture. The lecture began with a prayer for peace in Sri Lanka. Master said that although many of the people in Sri Lanka already have peace and happiness in their hearts, She asked everyone in the hall to pray for the people who have not yet found this happiness, and thus are suffering. Master pointed out that peace and happiness are our true Nature. We might try using such means as violence or force, thinking that these are ways to get what we want in life, but ultimately we have no better choice than to find peace and happiness within. This is returning to our Self and our own God Nature. 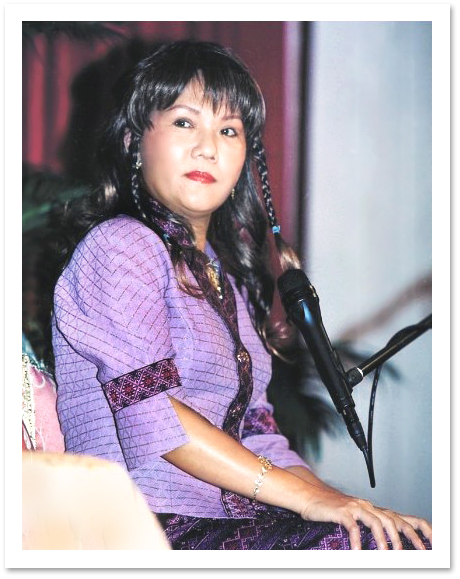 She went on to explain that the way of the Buddha and of all saints since time immemorial is the way of peace and love. That is also the way of our True Self. Some have attained this peace and love through deep meditation or prayer. The Buddha came to this world to show us that we are also God. In one of the Buddhist sutras, it is mentioned that enlightenment is like a light that is passed from one to another. 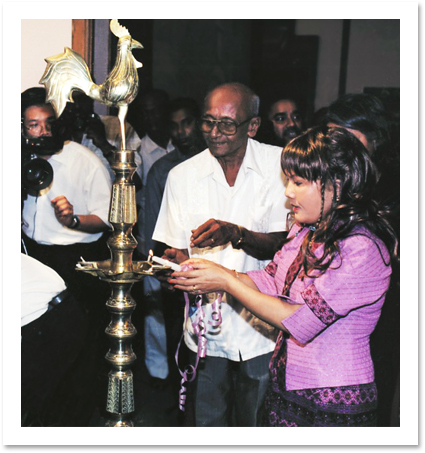 Hence, we still have candle-lighting ceremonies in the Buddhist tradition. Some people who have heard the name of the Buddha and may have even studied the scriptures of the enlightened ones still have not found peace and happiness, perhaps because their light has not been lit. Enlightenment is like lighting one candle with another already-lit candle. A person must have a lit candle before he or she can light those of others. Candle-lighting ceremonies in the Buddhist tradition remind us to light our inner True Nature. By remembering our own God Nature, we can remind others of their God Nature, because we are all born from God. The Buddha said, "I am the Buddha; you are the future ones." The God Nature inside the Buddha and inside of us is exactly the same. That is why we can also become God. The reason we do not see our God Nature is because we have not tried. If we sincerely want to try, we will be shown the way. It is written in the Diamond Sutra that no matter how long a room has been dark, it takes just one second for a light to make the darkness disappear. The light passed from the Buddha has never gone out. All we have to do is find where the candle was last lit and then our candle will also be lit. The light is the essence of our being; it's our own God Nature. Everything that is noble, holy and powerful is the God Nature. That's why we call it "enlightenment". Different religions identify the God Nature with different names. Sri Lankans call an enlightened person "Buddha"; in Hebrew, this person is called "Christ". Sri Lankans also call a teacher "Guru", while English speakers call him or her "Teacher". Sometimes because of the limitations of human language, we misunderstand each other and have religious disputes. No matter where a Master is born, he or she is a "lit" candle, the light keeper for the next to come. Whoever comes to that person can be lit with this already-lit candle. The Universal Light never dies but must be upheld in different places: India, Sri Lanka, Germany, Jerusalem, and so on. It has to circulate so that the whole world will be awakened; it cannot be kept in one country or temple because the whole world has to know the light. Like water or rain, the light has to be in different places at different times to bless all the beings on this planet. So it doesn't matter where it is kept, if we want our own light to be lit, we should go to the Light-keeper. All of us want to know what the God Nature is; everyone wants to know where God is. God is within us. Buddha and God reside in this temple (Master points to Her body). We have nothing inside but Buddha and God, and we are nothing but the children of God. The one thing that separates us from our God Nature is the ego, also known as the mind. The mind is like a machine or computer, which records and then broadcasts the same thing out again. But the mind can only record and understand worldly information. It cannot comprehend the God Nature. In order to find our Selves, we have to bypass the mind -- go through it but not dwell in it. If we try to use the mind to find our Selves, we will only end up with worldly knowledge, customs, and habits. Even if we read the Buddhist Sutras and the Bible, we will not always understand what is written in these books. What is written by an Enlightened Master can only be understood by another Enlightened Master, by truly understanding, not guessing. Therefore, in order to understand the Master's teachings, we must try to become a Master. Master said that all of Her talk is actually boring theory, and that She prefers not to speak so much and would like, instead, to show the audience how to find their own God Nature. She said that it is simple because we already have God Nature. The problem is that we keep listening to the mind and forget to look for it. The moment we forget the mind, our worldly burdens and preconceived ideas, then we can find our God Nature. Master further explained, "When I show you how, it is not by talking to you that you know; it is by showing in silence, from God Nature to God Nature. At that instant, if you really concentrate well, you will see the God Nature right away, which is the Light, which is the heavenly teaching, the Buddha's teaching -- without language. And you will be enlightened immediately." "Not only do we see the Light, which is our own Nature, we also hear the teachings, our own Nature, which the Buddha mentioned in the Surangama Sutra. All the Enlightened Masters rely on this Sound stream, this inside knowledge, this inside teaching, to come down to teach sentient beings. And all sentient beings have to rely on this holy Sound, holy Vibration, holy teaching -- the inside teaching -- to go back to the kingdom of God. We will all become Quan Yin bodhisattvas, because we will all listen to the Sound that the Quan Yin bodhisattvas have listened to. We hear it inside without the ears and see it without the eyes. That is true knowledge." Master said that at the time of enlightenment, we can see the kingdom of God; we can learn with the saints, with Jesus Christ, and with all of the past Masters who have left our physical planet. We can see Buddha on a lotus, Jesus with light all around, and we can listen to direct teachings from Them. You can see light that is equal to thousands of the suns of this planet, but it will never blind your eyes. This is the light mentioned in the Buddhist sutras that tell us when we die, we should follow the bright light which leads us to heaven, to the Buddha's Land, not the dim light which can take us to the 'Asura' (astral) world. Each of us can see different kinds of light, due to our different karma, different concentration, or different sincerity. So each one sees differently when going inside, but everyone experiences a glimpse of his or her God Nature, a glimpse of heaven. That's just the beginning, and then we experience more as we practice each day. Master said, "I hope I have explained a little bit of this unexplainable thing. The only thing left is that you have to experience this thing yourself. You have to experience your own greatness, your own God Nature, because these things cannot be talked about, cannot be explained in any language at all." "It is just like when I am drinking water, and I talk about water: It is cool and refreshing and quenches your thirst. But you also must drink it in order to understand. You drink more, or you drink less; it depends on your thirst. But you have to drink. If you are not thirsty, of course you don't drink. Then you don't know what I am talking about. But I think you do. You remember, because everything I said today is nothing new. Our souls understand; our God Nature understands. Even if we don't drink, we remember the taste of water because all of us have drunk water at one time or another. It's just that we have forgotten, since we did not drink for a long time. Similarly, with the God Nature, we have ignored and neglected It for so long that we do not even dream of becoming God. We think we are just very lowly human beings, when in fact the one who lives in this temple [Master points to Her body] is God! Only God lives in here, no one else." Master continued: "That's why the Buddha said that you have to love and respect everyone, because everyone is truly God whether he knows it or not. But only an Enlightened Master can see this. In order to truly love everyone, you must also become a Master, or partially a Master. Actually, it's not 'becoming' a Master, but 'remembering' that we are a Master." Master then taught the audience a brief form of meditation, the Convenient Method. "If you want to know more, to study more deeply about how to remember yourself as God again, how to open your love to all humankind again, we have to go through a process called initiation so that we can explain things in more detail. And you have to do more meditation, every day, to contemplate your own God Nature." Referring to the process of attaining enlightenment, Master joked, "It took the Buddha six years; maybe it will take us ten years! No, the Buddha took six years because people taught Him the wrong way until the last method He found, then he became enlightened immediately. Only the direct recognition of the God Nature can make us enlightened. Every other method is like cooking sand; it will never become rice." After the lecture, Master patiently responded to numerous questions from the audience. Asked by one woman how she could be free of anger toward her husband and children, Master responded that the only way is to gain enlightenment. She said that these things happen because we don't know we are God. We react as human beings because we think we are ordinary humans who are bad. Once we remember that we are God, we will become calmer, more secure, more peaceful, more loving, more tolerant and more compassionate. Then we can see that our husbands and children are also God. Even though they may not know their true Nature, we will love them and respect them like God. One Muslim person in the audience praised Master, saying that She is the only One who can save us. Master thanked him, saying that Mohammed was a great Master also. She said that She already had caught up with the past Masters, but how about us? Master said we must hurry and catch up with them so that we can go to heaven together. Otherwise, She will be alone and that will be very lonely. Another person asked if the Buddha would be born again. Master said that the Buddha is born all the time. "Look at you, look at your neighbors; they are all Buddhas!" She said that the Buddha once told His disciples that since His God Nature and everyone else's God Nature were the same, He wondered why people didn't see this. Master said that She wonders the same thing. It is so easy to know that you are God, yet we forsake the biggest Treasure because we are too worried and busy making a living. But when we become enlightened, we are more intelligent, more loving, and our worldly life gets better, too. Then we can use our money and possessions to give to the poor and to help everyone. To overcome fear, Master said that we should become masters of our minds, and not let the mind tell us what to do. The mind thinks a lot of nonsensical things and makes us fear. Being enlightened, we don't lose anything and therefore have nothing to fear. Instead, we gain more inside and outside, so it is a good business! Asked if She can end the war in Sri Lanka, Master answered "No," saying that the war is created by sentient beings and must be solved and finished by them. You don't force your knowledge on your children, but teach them to learn by themselves. She said that if She used (miracle) power to force the war to end, then later another war would start and it could be worse. It is better to let the war resolve itself naturally. But if more Sri Lankan people remember their God Nature and meditate more, then it will minimize the war. The people who make war are also God, so they have to realize themselves that war is really unnecessary; they have to come to peace together. Responding to a question about whether people from all religions could become enlightened, Master said that everyone has the light of God inside; it doesn't matter what religion he or she follows. She further assured the audience of Her utmost respect for all of the past, present and future Masters. They taught the same thing; it's just that we have forgotten to look for the sameness between Their teachings. When asked about how one keeps from coming back as an animal, Master said that we have to live like human beings. The Buddha taught the Five Precepts so that we could maintain our human standards. Follow the Five Precepts, and you won't come back as an animal; follow the God Nature to become God, and you won't come back at all. After the lecture, many people learned the Convenient Method. Hundreds of Sri Lankans and others, such as the man mentioned earlier who had waited for an inner signal, received initiation. Finally, hundreds of "candles" were lit that night in Colombo, Sri Lanka, to shine in this little Buddha island!